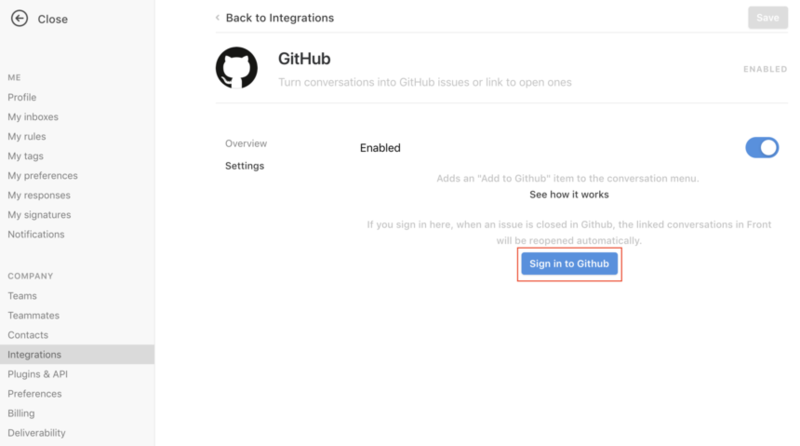 Like other integrations, you need to be an admin in order to enable the GitHub integration. The GitHub integration allows you to simply track and manage your development lifecycle. Go into your Settings and select Integrations. Scroll down the list, and click on GitHub. Turn the toggle on to enable GitHub. If you'd like to reopen conversations after a GitHub issue has been closed, then click the Sign in to GitHub button. 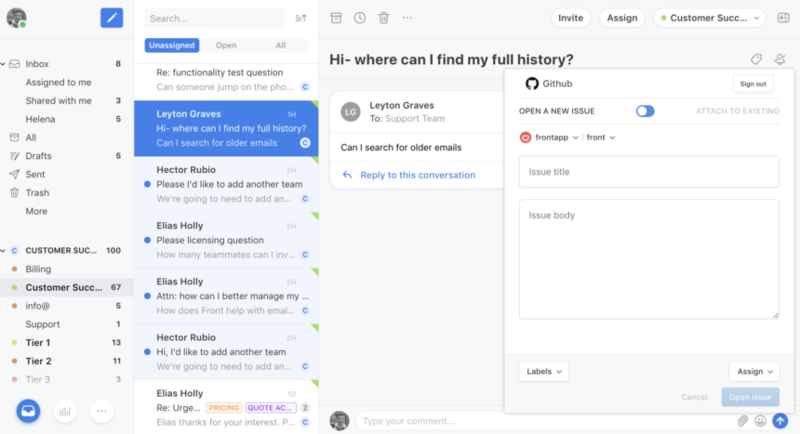 Once you're signed in conversations will reopen in Front when a GitHub issue is closed, allowing you to follow up and let the customer know it has been fixed. Click Save to finish enabling the GitHub integration. Now, go back into your mailbox view. Next to your subject is a tag icon. Click that, and select Github issue. The first time you use Github issue, you will be required to sign in to GitHub from Front using your GitHub credentials. Make sure you are logged into the GitHub account and click Authorize application. After that, complete the detail fields to create a new issue, or attach the email to an existing issue. When you're done, click Open issue. Your issue is now posted. You will see a tag to the right of the subject line of your email. You can click on that to see the task in GitHub. One of the best parts of this integration that you should definitely mention is that when a new GitHub issue is created OR an existing issue is linked, Front will append a link named `Front conversations` to the bottom of the GitHub issue description. 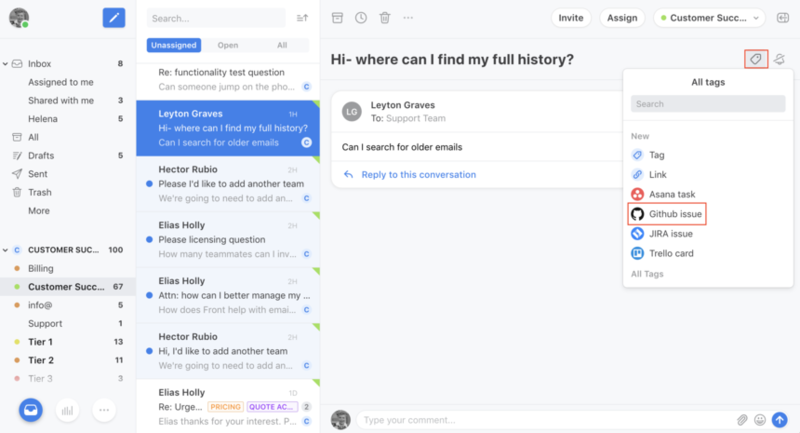 This is SUPER useful for accessing the email chain within Front!